Compared to our previous Saturdays, today has been a relatively quiet day. We visited a different farmers market (about 8 stalls) just on the outskirts of Glasgow where I picked up a loaf of walnut bread, Arran Blue cheese, a green cabbage and some dirty carrots. I was a little disappointed with the gruff response of one of the stall holders when I asked him some questions about the provenance of the vegetables. I dare not ask him the variety. 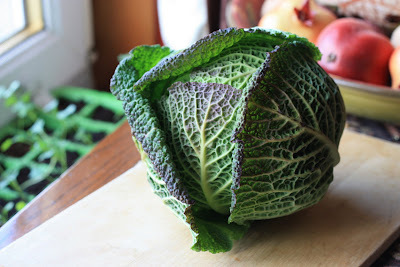 This savoy cabbage did not come from the farmers market today. I picked it up early in the week. So it was first vegetable in my home to be transformed for the plate. Oh for those of you with sharp eyes, you may note some pomegranates in the back. Sadly they are not real, only decorative pieces. I forgot to put them away with the Christmas decorations. One if the first recipes appeared on my blog was Romano peppers stuffed with feta, mint and lemon adapted from a wonderful and inspirational cookbook called Vegetable Heaven. I was so impressed with the recipes that I ordered the authors first book Veg: simple, stylish and seasonal vegetarian cooking. I was just as impressed. Neither of the books have photographs of the final dishes, but for me that wasn't an issue. It was about the recipes which are creative and packed with flavour. Catherine Mason the author of the cookbook describes this particular dish as a lively spicy stir fry for a winter day. I don’t disagree with her at all. It was certainly appreciated today with the weather turning all wet and grey. Cooking the cabbage this way, really made it the star of the dish. It was really tasty. By the way, the red chillies in the dish were home-grown and naturally dried in the window sill. We rarely do take-away food, but to give this meal more of a 'take-away feel', I had decided to accompany this spicy stir fry with 'egg fried rice'. It just seemed right. However if you wish to keep this meal completely vegan, you could just serve it with some plain boiled rice. Heat the oil in a large saucepan or wok until sizzling, then add the onion. Stir fry for a minute, then add the ginger and chillies. Stir fry for 1 minute, then add the cabbage. Stir fry over medium heat for about 5 minutes until tender but still with some crunch. Season with Tamari or soy sauce and serve immediately. This looks super good. I really want to use more ginger. I too often overlook it in my recipes. This looks like a great way to showcase the flavor. Great idea for cabbage. I often wonder what to do with it. 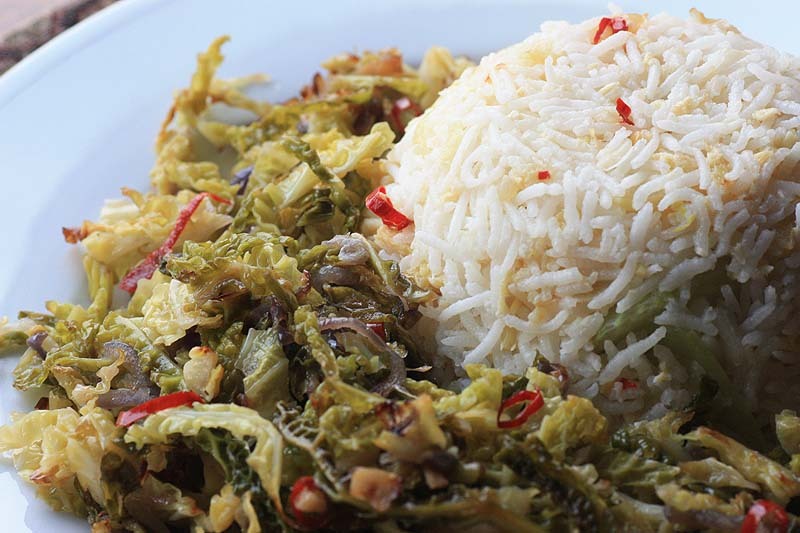 THe fried cabbage dish looks lovely, feeling like cabbage now! And how handy that you have the wild garlic on the side of the road! Wonderful recipes! I love savoy yet for some reason rarely cook with it. This sounds so light and flavorful. Gotta try these! The ginger flavour was lovely so was the gently heat from the chillies. The cabbage is often overlooked. It was a lovely dish. I'd have been happy to have shared some with you. The wild garlic was actually growing on the side of a countryside road. For obvious reasons, I am careful where I pick my free wild food from. It really is a light dish. I recommend it. Looks great. I have never heard or groundnut oil, what is it? I like this cabbage dish. I am one of those who find some cabbages difficult to digest (no, I am not the farting type, honestly :-), I just get tummy ache), but I think that chili and ginger have some magic in them, and are super suited to cabbage!!! Ah Missy, I should have made it clear. Ground nut oil is simply peanut oil. I sometimes find cabbage too chewy. 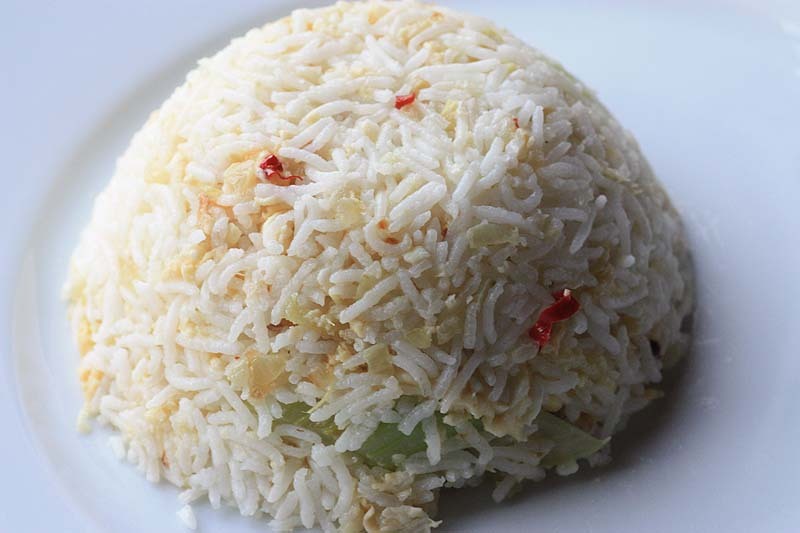 This dish should hopefully not give you a belly ache - the ginger as you noted yourself should do its magic! Wow... great pics! The dish looks delicious! How are you girl? I am like Forrest Gamp from the movie lately... i run and run and run all day... non stop! I'm good. Enjoying the long weekend. I hope you get time to stop from all the running. This is actually the first time ever I have made and eaten egg fried rice. I was quite pleased with the result. Veg Spring rolls - mmm now I do like them. 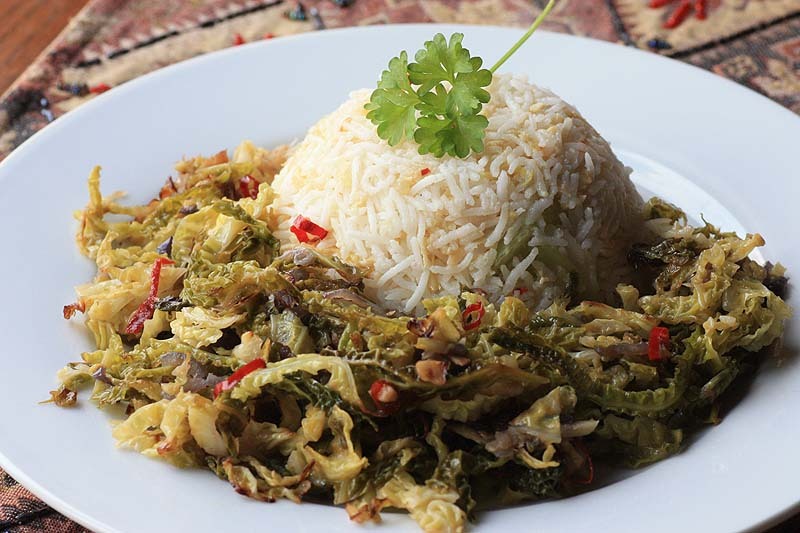 I've recently begun using cabbage, though i've not as of yet had the testicular fortitude to try it in a stir fry (usually stash it in stews). I think i'm definitely going to give this a shot! Welcome and Thank you for your interesting comment ViciousVegetarian. Please do try it, it really was a splendid dish. I wholeheartedly recommend it. So fresh and tasty hope my cabbages do well this year, would love to give this one a go with homegrown crop. 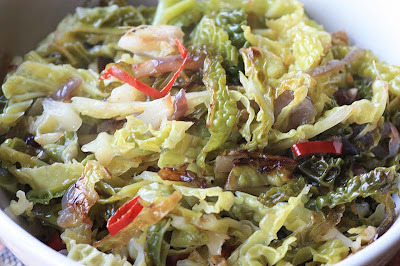 If there is a cabbage recipe I would recommend to make, it would certainly be this one. I really enjoyed it. I too am hoping to grow a handful of cabbages in my plot. Here's hoping!